Seborrheic keratosis is a common skin growth that some people develop as they age. While some people only get one or two growths, it is more common to have many. They often appear on the back or chest, but can occur on any part of the body. These growths are not contagious, and are also not cancerous. The appearance of seborrheic keratoses can vary widely in both color and size. 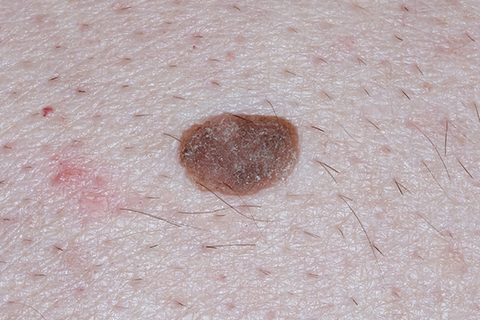 They may be light tan to brown or black and may resemble warts or moles. Their size can range from very small to larger than 3 cm. Seborrheic keratoses may have a waxy, pasted on the skin look. Some look like a dab of melted brown candle wax on the skin, whereas others may look like a barnacle stuck to a ship.